So, I've had these Dazzles stickers in my stash since Christmas. My daughter saw them on HSN and fell in love. She's used some since we got them, but I hadn't until now. I've seen people rave about these online, and I didn't see what the big deal is. They're just stickers, right? We've been using stickers in our papercrafts since the dawn of time. Yesterday, I needed a fairly quick birthday card, so I decided to give these a try. Okay, now I get it. Now I understand why people rave about Dazzles. What I personally like about them is the versatility. They can be layered over printed paper or cardstock to get lots of different looks, and the sets include main images, accessory stickers, borders, corners, sentiments, so you can get a finished look easy peasy. One rookie mistake I made: after I took the photo (and put the card in the envelope) I realized that I had left off the lady's earring. 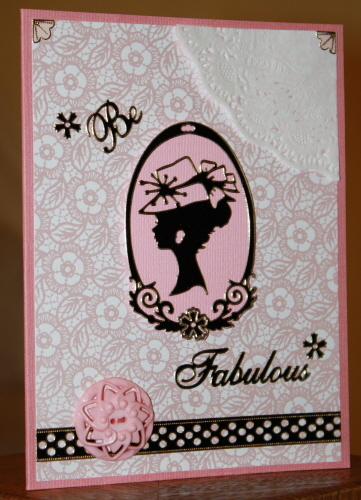 Bottom line: They are so much fun to play around with, and that's the whole point of papercrafting, isn't it?